Andrew B. Cook, merchant, farmer, and founder of Cookville, Texas, was born in Macon, Georgia, April 3, 1836……Andrew B. Cook came to Texas in 1851, began farming, and continued in this vocation until 1862 when he enlisted in the Confederate army, and served until the surrender in Mississippi, Georgia, Alabama, and Tennessee. At Oakland, Mississippi, a rifle-ball struck him in the shoulder, but notwithstanding the wound he afterward took part in many severe battles, such as those at Franklin, Holly Springs, Iuka, Lumpkin’s Mills, Murfreesboro, Nashville, Vicksburg and many other places. He was twice captured; first at Franklin, Tennessee, and held eighteen days, and again near Pilot Point, Georgia and kept prisoner eight and one half months. In 1867 Mr. Cook embarked in mercantile business at the little town of his own founding – Cookville, on the St. Louis, Arkansas & Texas Railway – but still continues farming, and now owns about one thousand acres of fine land, four hundred of which he has under cultivation, raising various or mixed crops.The marriage of Mr. Cook took place November 20, 1856, to Sarah G., daughter of Seaborn Rountree, a native of South Carolina. Twelve children have been born to this union, and eleven named as follows…and one that died unnamed. Mr. Cook is a consistent member of the Primitive Baptist church, and a good and useful citizen. This is the only record I’ve seen of the date of his marriage to Sarah Gray Rountree, daughter of Seaborn J. Rountree and Elizabeth Rogers, although the fact of the marriage is repeated in the records of Seaborn Rountree’s family. The absence of early records of Titus County (mostly destroyed by the courthouse fire of 1895) make it difficult for us to obtain additional material. However, according to a pamphlet published several years ago by the Hon. 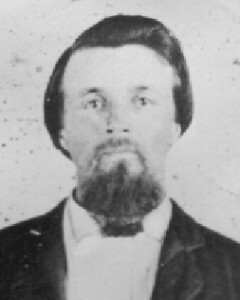 Wright Patman, Andrew B. Cook was the postmaster of Daingerfield in 1851 and the first postmaster at Cookville (which was called Clay Hill at the time). His son Samuel A. Cook was also a postmaster. I also found several CSA records in the Texas state archives. They show that Andrew Cook was a private in the Anderson City Guards on the muster roll of 20 May 1861, and in the Spring Hill Reserves of Titus County on the muster roll of 13 July 1861. He was a private in Company I of Whitfield’s Legion of the 27th Texas Cavalry (his older brother Jesse Cook the Captain), enlisting in January 1862 for twelve months. He must have continued in service, but I found no other records. The flag bearer story is not only repeated in the article noted in the above footnote, but also in his obituary. A.B. Cook, of Cookville, Texas, was suddenly called hence Thursday night, Nov. 13th, at 11:30. His fatal illness, neuralzia of the heart was of only two days duration, and while he and his physicians realized the danger he was in, his death was quite a surprise and a shock to all. A.B. Cook, merchant, farmer, and founder of Cookville, was born in Macon, Ga., April 3, 1836, come to Texas in 1851, enlisted in the confederate army in 1862 and served until the surrender. He was in Mississippi, Georgia, Alabama, and Tennessee. At Oakland, Miss. He was severely wounded, but afterwards engaged in many severe battles such as Franklin, Holly Springs, Iuka, Lumpkins Mills, Murfersboro, Nashville, Vicksburg, and many others. In the death dealing contest at Iuka, two brothers older than himself of Whitesfields Legion color bearers, each falling successively, a third, the subject of this sketch, grasped the bloodstained banner from the prostrate forms of his wounded brothers and bore it aloft to a glorious victory.5 At our state capitol says The Southern Home Magazine. That group of heroes should be memorialized in bronze or granite, a parallel of which defies the world. He was twice captured, first at Franklin where he was severely wounded and kept in prison 18 days, and again at Pilot Point and held a prisoner eight months at Indianapolis. In 1867 Mr. Cook embarked in the mercantile business in the little town of his own founding, Cookville, Texas, and continued in that occupation until his retirement in 1896. He was a consistent member of the Primitive Baptist church, having joined that church at the age of eighteen. Almost as regular as the Saturday before the first Sunday of each month came, he would be found on his way to Spring Hill church where his membership has been for forty-eight years. Major Cook had his peculiarities, yet those who knew him best loved him, and to know him intimately was to admire, respect, and love him. He is in the 1860 through 1880 censuses of Titus County. In 1880, he is listed as a dry goods merchant, with all but the first and last child in the household. In the 1900 census of Titus County, he is listed as a “landlord”, with Doctor A., Reuben R. R., and Eva L. Cook still living at home. His widow Sarah G. Cook is listed in 1910 with Doctor A. and Eva L. still at home. Sarah G. Cook lists herself in both censuses as the mother of 12, nine of whom were living. The three deceased children were two who died as infants and Samuel Asa Cook, who had died in 1894. Sarah G. Cook died on 14 March 1915 in Cookville, of “poresis” according to the death certificate. Reuben Cook’s comments about each of his brothers and sisters, made sometime in 1963 or 1964, are reproduced below in italics.6 According to Reuben Cook and others of the family, one of the two additional children who died as infants was named Joe Ivey Cook, the other was apparently unnamed. 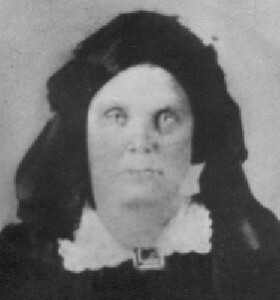 Elizabeth Virginia Cook (14 September 1859 – 14 December 1952) From Reuben Cook’s article: Lizzie, born September 14, 1859; died December 14, 1952; married Alex Keith; also about 12 children – 8 now living. She married John Alexander Keith about 1876 according to the 1900 and 1930 censuses. They are listed in the 1880 Titus County census living in Cookville with a son who apparently died as a youth and baby daughter Minnie.7 They are enumerated in Cookville in the 1900 through 1930 censuses with a total of nine children: Minnie M. Keith (Mar 1880), Flora Lena Keith (Oct 1882), Tiny S. Keith (Jul 1885), Sallie M. Keith (Feb 1888), Anna J. Keith (Nov 1891, called “Leffie” in 1910), Warren Floyd Keith (Apr 1893), Nellie E. Keith (Aug 1896), Reuben Cook Keith (Jan 1899), and Eugene Keith (1903). Samuel Asa Cook (26 April 1866 – 26 April 1894) From Reuben Cook’s article: Samuel Asa, born April 26, 1866; died April 26, 1894. Was a physician and got $10.00 for “matriculation” – that is, for delivering a baby. He was evidently unmarried. Josephine Florence Cook (12 November 1869 – 6 July 1943). From Reuben Cook’s article: Josie, born November 12, 1869; Died July 6, 1943; married W. A. Priest, Greenville, Texas, once Superintendent of Schools; had four children – 2 boys and 2 girls – all living. Her names may originally have been reversed, judging from the 1870 and 1880 censuses. She married William Allen Priest 1885. They are in the 1900 through 1930 censuses of Greenville, Hunt County (with Josephine the head of household in 1930.) The children were Roy Cook Priest (18 Feb 1889 – 14 Feb 1978), Jewel J. Priest (16 Mar 1891 – Oct 1976, married of John M. Neely), Robert Barney Priest (11 Apr 1899 – 11 Jan 1971), and Willie Jo Priest (19 Jan 1904 – 19 Dec 1978, unmarried).8 Both parents and three of the four children are buried in East Mount cemetery in Greenville, Hunt County. Flora Winifred Priscilla Cook (3 February 1871 – 1 October 1946) From Reuben Cook’s article: Illa, born February 3, 1871; died October 1946; married Sandy C. Tabb, lived in Waco. Had two boys and 1 girl – all living – Oscar, Carroll, and Virginia. Her death certificate identifies her name as Illa Winifred, but family records give her entire name as above. She married Sandy Clinton Tabb about 1895. They are in the 1900 census of Collin County with two sons, Oscar C. Tabb (17 Jun 1897 – 2 Sep 1967) and Carroll C. Tabb (9 Nov 1898 – 4 Jan 1968). By 1910 they were living in Waco, McLennan County, and had added a daughter Virginia Tabb (c1907) to the family. They remained in McLennan County. Doctor Alfonso Cook (17 August 1875 – December 1964) From Reuben Cook’s article: D. A. (Doc), born August 17, 1875; lives on ranch in Thornburg, Arkansas. Lost his wife, Louise Cheever, in February 1962. About 1895 was cashier of the first bank in Alpine, and bookkeeper for large supply house in which the bank was located. Later was Cashier for Equitable Life state office in Albuquerque, New Mexico, and was Cashier of Morris County National Bank, in Naples. Had farms and a general store in Cookville. He is in his parent’s household in 1800 and 1900, and in his mother’s household in 1910, as “Doctor A.” His World War I draft registration card identifies him as “Doctor Alfonzo Cook” of Little River, Arkansas. By 1920 he had married Louise Cheever and they were living in Little River, Jackson County, Arkansas with no children, with Doc listed as a bank president. In 1930 he was living just four doors away from his brother Reuben Cook in Wichita Falls, Wichita County, Texas where Doc was listed as president of a building and loan association. Doc and Louise apparently had no children. The Social Security Death Index gives his death date, in Arkansas, as above. Rueben Rogers Rountree Cook (8 October 1877 – 1 December 1973) Though he consistently appears as “Reuben R. R. Cook” in records, interviews with his children disclosed his full name. About himself, Reuben wrote that he married Edna Ola Keith, daughter of W. A. (Doc) Keith, on 22 March 1901. He worked as agent for the Cotton Belt railroad from 1892 to 1904, then entered the banking business in Texarkana and continued as banker and bank examiner until 1936. He then worked as a field auditor for the Texas Employment Commission until retirement, then worked another fourteen years as office manager of a machine shop. He was till I his parents’ home in 1900 but in 1910 was living in Texarkana, Bowie County, Texas. In the 1930 census he was four houses away from his brother D. A. Cook in Wichita Falls, Wichita County, Texas, listed as manager of a building and loan company. He was living in El Paso when he wrote the article, and died there in 1973. Rueben wrote that he had one child, Andrew B. Cook (age 6 in 1930 census). Eva Leanna Cook (30 October 1879 – 17 July 1973) From Reuben Cook’s article: Eva, born October 30, 1879; widow of James Buchanan. Lives in Ft. Worth. Lauralee, her only child, lives with her. She was still living at home in 1900 and 1910. In the 1920 census of Cookville, she was “Eva Cook” wife of John H. Buchanan, with a daughter “Laura Lei” (age 1) in the household. She died in Mt. Pleasant, Titus County, according to the Social Security and Texas death indices. Reuben Cook’s correspondence identifies her full name as above. Saddie Gay Cook (3 February 1882 – Nov 1976) Her name was perhaps “Saddie Gray” after her mother, rather than the “Saddie Gay” recorded in a family record. From Reuben Cook’s article: Saddie, born February 3, 1882; lives in Denver, Colorado. Widow of Bolivar C. Barrier, who died about 1933. Had one boy, Barney, deceased and one girl, married. Bolivar was a well known banker in Wylie, Dallas and Texarkana, being one of the organizers of banks in those cities. They are in the 1900 census of Collin County, married two years, with no children. In 1920, her husband was enumerated as a temporary boarder in Dallas, while Saddie and two children are enumerated in Denver, Colorado. In 1930 they were living in Denver with both children at home. She died in Denver according to the Social Security Death Index. From censuses the children were Barney C. Barrier (c1904), Betty W. Barrier (1919).